For all the hype and hoopla over Davy Fitzgerald's maiden season as a Model County manager, Saturday actually heralded something of a first. 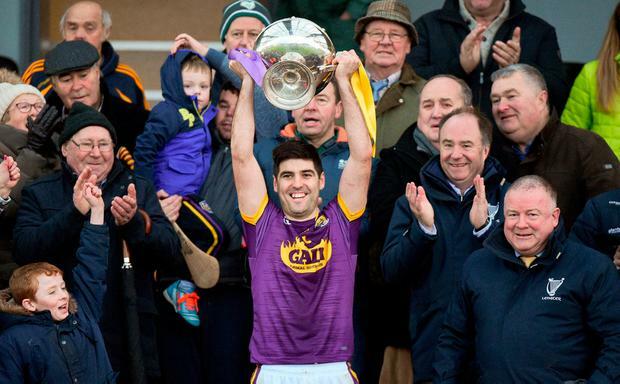 By dint of beating Kilkenny in a novel free-taking shootout - after normal and extra-time couldn't separate the sides - Fitzgerald secured a first piece of silverware with his adopted Wexford. Whatever happens for the rest of 2018, the Clareman can rest assured that he brought the Bord na Móna Walsh Cup back to Slaneyside for the first time since 2002. Not that this was forefront in his post-match thoughts after a surprisingly pulsating, not to mention feisty, Nowlan Park decider. With a more significant Allianz Hurling League trek to Waterford's Walsh Cup looming next Sunday, Fitzgerald preferred to focus on what needs to improve. "In the first 20 minutes Mark Fanning made two or three incredible saves - so we could have been down 13 or 14 points, we were absolutely pathetic," he cautioned. "If we start that way against Waterford we'll be out the door and gone - we'll be hammered. We can't afford to start that lackadaisical; we did it against Dublin last week," he reiterated. So far, so negative. The good news for Wexford is that Saturday's 3-2 success - in a freetaking competition that followed a 1-24 each deadlock - provided a thrillingly upbeat end to an afternoon that augured so poorly to begin with. It was Davy Fitz's first trophy with Wexford, having last year lost a Walsh Cup semi-final (to Kilkenny), a league semi-final (to Tipperary), a Leinster final (to Galway) and an All-Ireland quarter-final (to Waterford). Arguably of greater significance, it maintained Wexford's recent whip hand over their long-time Kilkenny oppressor: this makes it three victories on the bounce, coming in the wake of last year's league quarter-final and Leinster semi-final. And then there was the battling refusal to accept defeat. Aided by a penalty from the inspired Alan Murphy (who would finish with 1-13 in brackets), the hosts were eight points clear by the 23rd minute, leading 1-10 to 0-5. "After the first 20 minutes we settled and started to pull back the lead and were well in touch by half-time," said Fitzgerald, whose team trailed by a more manageable 1-13 to 0-11 at the break. "So I'm happy that we were able to pull it back." Not so happy was Brian Cody, sent to the stand after remonstrating over the 38th minute straight red brandished to Richie Reid for pulling off an opponent's helmet. Wexford stayed in touch but Kevin Foley's 67th minute goal, scrambling a loose sliotar to the net, opened the door for two injury-time points from Paul Morris to level the tie at 1-21 apiece, forcing extra-time. When they still couldn't be separated, a week after the Meath and Longford footballers required a similar shootout, we had the GAA's first ever freetaking competition to decide a cup winner. Kilkenny raced into a 2-0 lead thanks to Eoin Murphy and Conor Martin, but misses allowed Conor McDonald and Jack Guiney to level matters before 'keeper Mark Fanning pushed them ahead with what proved the winner. Kikenny's fate was sealed when John Walsh missed their last free. Scorers - Wexford: P Morris 0-9 (0-7f), J Guiney 0-5 (0-3 f), K Foley 1-0, H Kehoe 0-3, C Dunbar, M Fanning (0-1f), D Dunne, E Moore, Jack O'Connor, L Chin, C McDonald 0-1 each. Kilkenny: A Murphy 1-13 (0-7 f, 0-1 '65', 1-0 pen), E Murphy 0-2 (0-2f), W Walsh, O Walsh, M Keoghan 0-2, C Fogarty, R Reid, C Martin 0-1 each. Wexford: M Fanning; S Donohue, L Ryan, E Moore; A Maddock, S Murphy E Martin; J O'Connor, K Foley; A Nolan, C Dunbar, H Kehoe; P Morris, J Guiney, D Dunne. Subs: M O'Hanlon for Martin (28); D Reck for Joe O'Connor (ht), Jack O'Connor for Dunbar (ht); L Chin for Guiney (60); C McDonald for Kehoe (62); P Foley for Nolan (66), J Firman for Dunne (66); D O'Keeffe for Maddock (6 extra-time); A Nolan for O'Connor (16 et); J Guiney for Ryan (20 et). Kilkenny: E Murphy; J Holden, P Walsh, P Deegan; E Morrissey, C O'Shea, C Buckley; C Fogarty, O Walsh; M Keoghan, R Reid, P Lyng; A Murphy, W Walter, C Martin. Subs: L Ryan for Lyng (49), C Bolger for Martin (49); C Browne for O Walsh (70); J Maher for Morrissey (74); J Walsh for Bolger (9min et), C Martin for Keoghan (9 et); G Malone for Fogarty (inj, 15 et). REF: J O'Brien (Laois).